✔ Italian manufacturer with 25 years reliability in UK Market. ✔ Commercial warranty with 5-star aftersales care. ✔ Stainless steel critical components with thermoplastic wash arms. ✔ Energy efficient insulated boiler. ✔ Low water consumption. 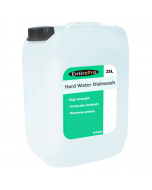 Only 3 litres per wash.
✔ Guaranteed hygienic rinse at 85c. Wash at 60c. ✔ Selectable 90 or 180 second wash cycles. 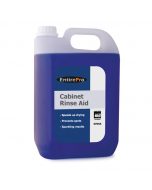 ✔ Detergent & Rinse aid pumps fitted as standard. 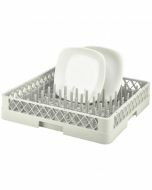 ✔ Free dishwasher baskets & cutlery insert. ✔ Corner sited or straight through operation. 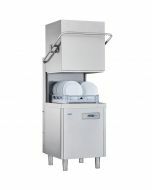 The Kingfisher KPTDW Pass Through Dishwasher is an entry-level hood type commercial dishwasher well suited to medium and light duty scenarios. It provides operators a low-price solution without any compromise on quality, durability and reliability. 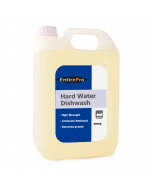 Utilising 3-phase power to deliver quicker heat up and recovery times, this pass-through dishwasher can wash a full load in just 90 seconds, making it ideal for areas where requirements peak dramatically or are busy throughout day. 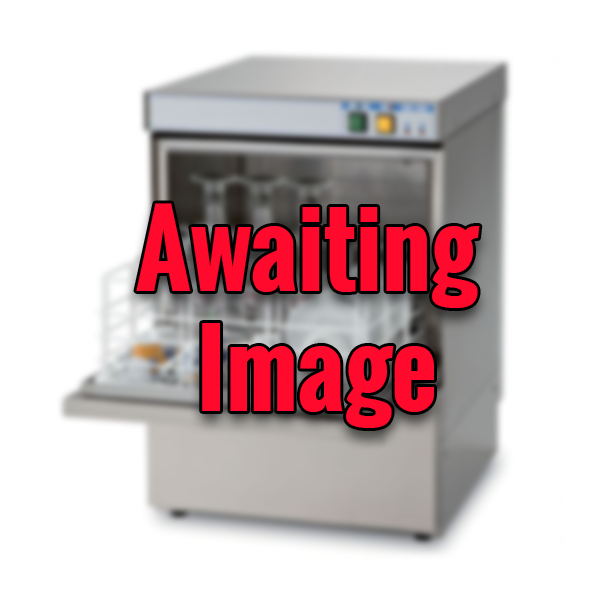 The Kingfisher Pass Through Dishwasher provides completely automatic operation with operators able to select between a rapid 90 second wash cycle for general use, or a heavy duty 180 second cycle that is great for pots and pans. Automatic detergent and rinse aid dispensers are included as standard to ensure the perfect concentrations whilst an automatic drain pump takes care of waste. Rounded tank corners prevent grease build-up and a wash tank filter traps debris to prevent blockages and damage to components. 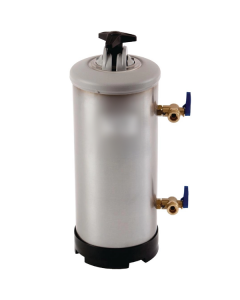 Filters, wash arms and jets are easily removable for cleaning and all serviceable components are accessible from a front panel. 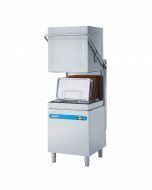 Featuring an upper and lower rotating wash arm powered by a high capacity wash pump, the kingfisher passthrough can clear the most baked on grease and grime. Featuring rounded tank corners to prevent grease build-up and a wash tank filter to trap debris and prevent blockages and damage to machine internals. Filters, wash arms, jets are also easily removable for deep cleaning whilst all major components are also accessible from a removable front-panel for easy servicing. 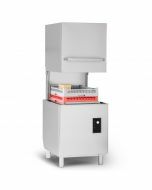 Unlike many budget machines, the Kingfisher pass through is manufactured from high-grade stainless steel throughout. 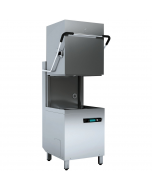 Assembled in Italy to CE standards and supported by a UK nationwide service team, the Kingfisher pass through dishwasher is a robust and reliable commercial unit that you can rely on. 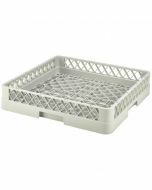 The plate basket runners can easily eb adjusted during installation, making the Kingfisher Passthrough Dishwasher suitable for corner-sited or straight through operation. The hood also includes an intelligent sensor to monitor opening and closing to automatically start operation. Unlike many of our competitors, we don't charge for the essentials to get you up and running. The Kingfisher Pass Through Commercial Dishwasher comes as standard with all waste and water hoses for UK installations within 1 meter of services. Also included is two commercial dishwasher baskets and a cutlery insert for knives and forks. Requires hard wired power connection so professional installation is recommended. 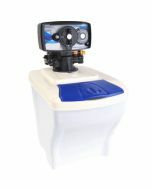 The machine should also be used with a water softener to guarantee wash results and machine longevity. Failure to do so may invalidate your warranty in hard-water areas.